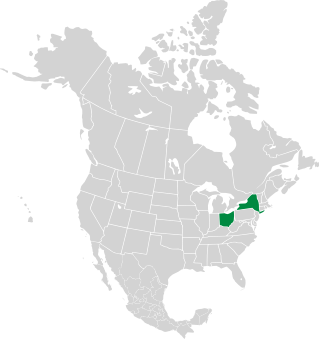 Americus giganteus (Lindl.) W.H. Hanford nom. utique rej. 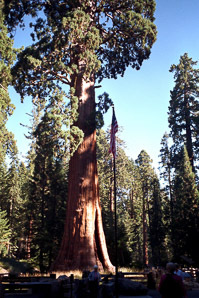 The giant sequoia is the only living species of genus Sequoiadendron, and one of three living species of cone-bearing trees called redwoods. 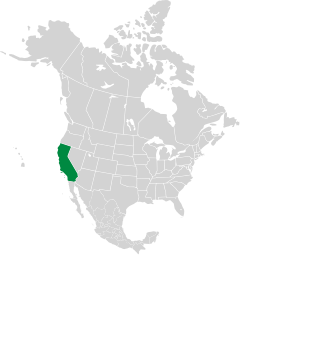 They are found on the western slopes of the Sierra Nevada mountains in California. 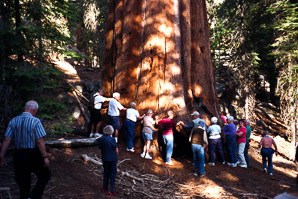 Interested in the oldest trees? Check this Wired magazine article. 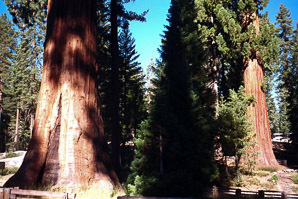 Identification: Although California redwoods are taller, giant sequoias have a larger volume. Giant sequoias reach 164-279' (50-85 m) vs. California redwoods, which top out at 377' (115 m). 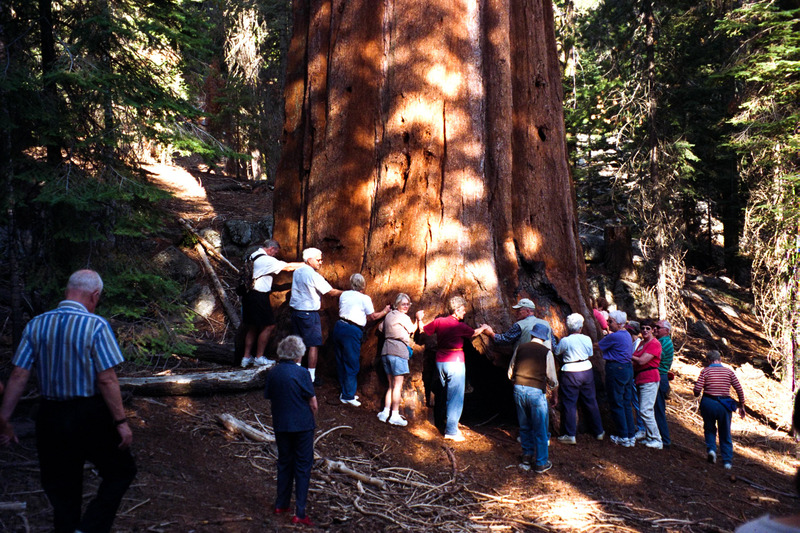 Giant sequoias also live longer, up to 3,500 years. Bark, up to 3' (91 cm) thick at the bottom of the tree, is fibrous and furrowed. Leaves are ¹/₁₆-³/₁₆" (3-6 mm) long, arranged in spiral whorls. Cones are 1½-2½" (4-7 cm) long. 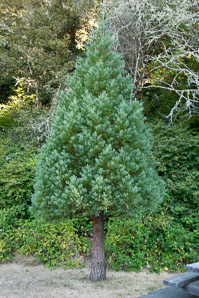 (Photo 1 is a baby tree planted in 1981, not a trick of perspective. Plant Up to 377' (115 m) tall, living up to 2,200 years. 164-279' (50-85 m) tall. 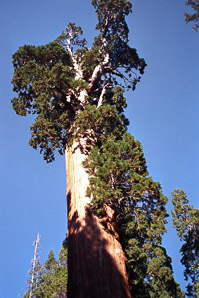 Up to 148' (45 m) high, up to 6½' (2 m) in diameter. 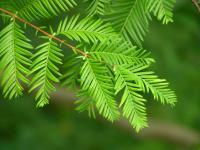 Needles ¹/₃₂-1" (1-30 mm) long, in a branching configuration or in opposite pairs. 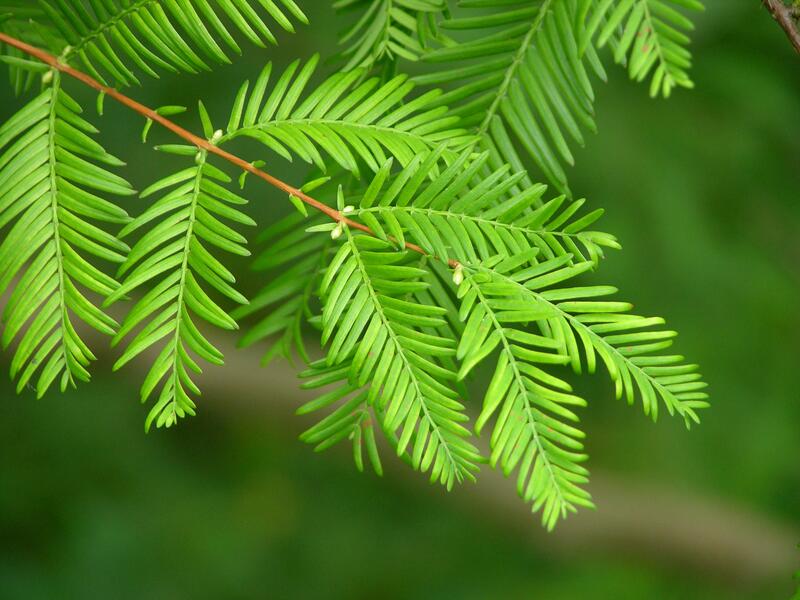 Photos of mature sun-illuminated foliage (left) and shade foliage. Photos by Christopher J. Earle. ¹/₁₆-³/₁₆" (3-6 mm) long, arranged in spiral whorls. Small branchlets 3" (7.6 cm) long, with needle-like leaves about ⅜" (1.2 cm) long and ¹/₁₆" (1.6 mm) wide. Stem Bark up to 12" (30 cm) thick at base. Bark, up to 3' (91 cm) thick at the bottom of the tree, is fibrous and furrowed. Bark reddish brown when young, becoming fissured an gray. Fruit Oval, ½-1¼" (1.5-3.2 cm), with 15-25 spirally arranged scales. Cones are 1½-2½" (4-7 cm) long. Cones are ½-⅞" (1.5-2.5 cm) in diameter, with 16-28 scales. Sequoiadendron giganteum description by Thomas H. Kent, last updated 2 Jan 2019.